LoL's no laughing matter. Millions of gamers from more than 145 countries play the multiplayer online battle arena (MOBA) game League of Legends daily, some of them are skilled enough to engage in ultra competitive tournaments for the chance to win a chunk of the multimillion-dollar prize pools. Check out the October 2012 infographic below. Since November of last year, 11 million monthly active players have become 32 million…and Teemo dies 324% more frequently! Zombie outbreaks happen. Gear up with REI to avoid getting eaten by moaning masses of undead cannibals. This infographic provides an overview of the 13 essential pieces of equipment you'll need and provides step-by-step illustrations demonstrating critical zombie survival skills. 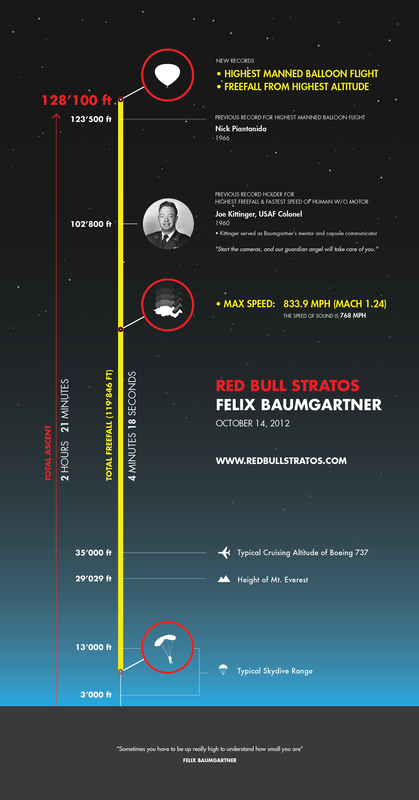 On October 14, 2012, Felix Baumgartner broke the sound barrier in his free fall 24 miles above the Earth. This infographic records his achievement. Even though Americans love to think we’ve cornered the market on economic freedom, that’s been becoming less and less the case in recent years. Why is this becoming the case and what parts of the world can claim more economic freedom? Take a look and see. Pit bull ownership has been a hotly debated topic in recent years. The pit bull, at one time bred for fighting, has consequently become notorious for vicious attacks, thus encouraging many cities and counties to elect and enforce breed-specific legislation (BSL) that essentially bans pit bulls. In response to these breed-specific laws, pit bull owners are speaking out, claiming biased media attention and irresponsible ownership is to blame for the public's negative view on this beloved family pet. 1800PetMeds has researched the positions, politics and perspectives related to pit bulls and the pit bull debate, to shed some light on this hot-button topic. Some of the pit bull myths and facts in the infographic below may surprise you. During the five-year long real estate crash, US home values have dropped by over a combined $9 trillion. This infographic provides an overview of the electric car industry and describes their environmental and energy impact… This visualization offers numerous statistics, facts and global comparisons on the future of electric vehicles, in terms of costs, environment, sales and the role of electric vehicles in our transportation systems across the globe. OK so we have all seen the Rags to Riches stories. Well we thought we would turn it on its head and see if anyone has gone from Riches to Rags. The rock n role lifestyle is notorious with people making a lot and then blowing it all. I guess it does not matter if you’re rich or if your poor managing your money and living within your means is pretty important. Extreme Sports athletes are some of the most fearless, some might say crazy, humans on earth. They are driven by pure adrenaline, and the fact they they’re risking life and limb on a daily basis only seems to fuel their fire. The unrelenting pursuit of progression leads these athletes to push the boundaries and test the limits of what’s possible, sometimes resulting in serious or fatal accidents. But you can only have ONE TRUE badass of the bunch and Krush set out to find who that is. IT professionals enjoy a continuously increasing demand for their services due to the industry's constant evolution with advancements such as social networks and mobile applications.